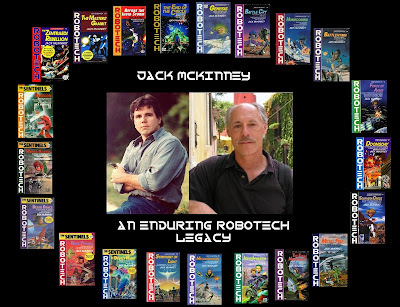 ROBOTECH: THE MCKINNEY PROJECT PODCAST is a celebration of the Robotech Novels written by Brian Daley and James Luceno also known as JACK MCKINNEY...and it also a celebration of both gentlemen for their immense contribution to Robotech's history and creating a LEGACY that has endured for more than 25 years. The celebration will involve the telling of the Robotech story through "Jack McKinney's" words and segments related to the story such as....concepts exclusively used in the Novels, character biographies, Robotech comics connections and any other subject that merits talking about when related to the Novels. And last but not least, getting to know more about Brian and Jim. Now the presentation of the Robotech novels themselves will be a mix of excerpt readings (including prologues and epigraphs) and chapter summary commentaries. ....We WILL go through every chapter of each novel, but this will not be an audiobook presentation. The summaries and commentaries are of the host and show alone and are not meant to "declare" anything to the listeners.....Some listeners might have other interpretations of events or dialogues that occur in the Robotech Novels story and are encouraged to present them either through comments on this blog, our Facebook page or by email, whichever is more convenient. ....As we establish a rhythm of shows, I would like at some point present those thoughts as I want this to be an interactive experience for those listening. There are many instances in the Robotech Story told in the Novels that will leave it up to the reader to make a conclusion or how to "connect the dots"......and I will do that......but keep in mind...they are the conclusions of one fan and I will invite listeners to express their thoughts on those instances as they come up.....There will also be times where I won't know how to do that and will seek your "guidance"! Any questions or comments, just let me know!